Over the past decade and longer, premier hotels in major metropolitan areas have been engaged in a furious and bloody cold war of design. It must be incredibly harrowing to have to maintain a lead when you’re neck and neck against some of the best designers in the world, all trying to give their client hotels an edge. In scenarios like this, it’s clear that every little bit helps down to the grout work. No stone can be left unturned in pursuit of the angle that makes their rooms unique. Price: The sliding scale of room service costs can be dramatic. In Los Angeles, a simple club sandwich can cost on average over $13. This is because savvy as they are, hotels liberally exercise price discrimination. Know-how: While often the hotel restaurant prices will actually be reasonable in contrast to room service, many guests just don’t know it’s cheaper. Ornate or Functional: Kitchens in hotels have been largely ornamental over time unless you were a traveling salesman who didn’t want to heat up bacon with a trouser press. However, for budget purposes and to transform the room into a home away from home, many guests are opting to make full use of the space; cooking in the kitchen is no exception. You can even find helpful guides online that let you know what to pack for it. If you’re traveling to Southern California and interested in a hotel with all of the kitchen amenities that will make cooking a fun convenience, read on! 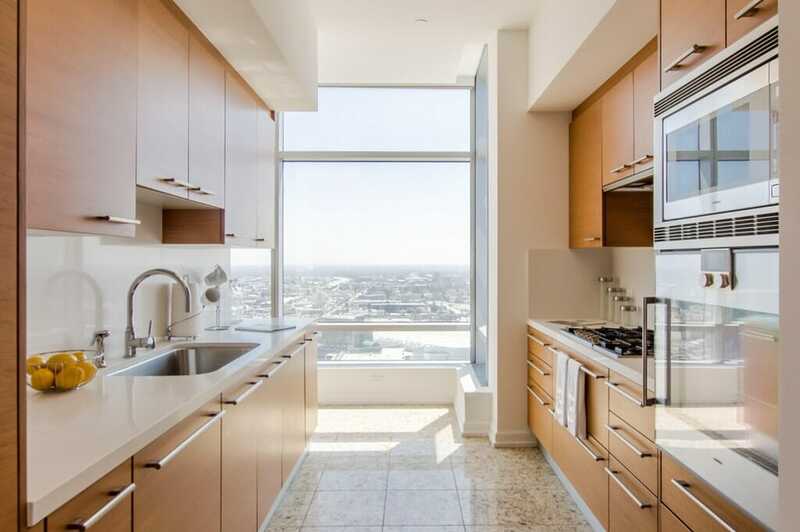 We investigated the details of some of the more recently remodeled spots in Los Angeles to see what directions they went with their modern kitchen cabinets. If you’re following a guide like the one mentioned above, you’ll need plenty of accessible space for your tool kit! These 3 hosts of suites are following a sweeping new trend of renting out “apartels”, part apartment and part hotel. 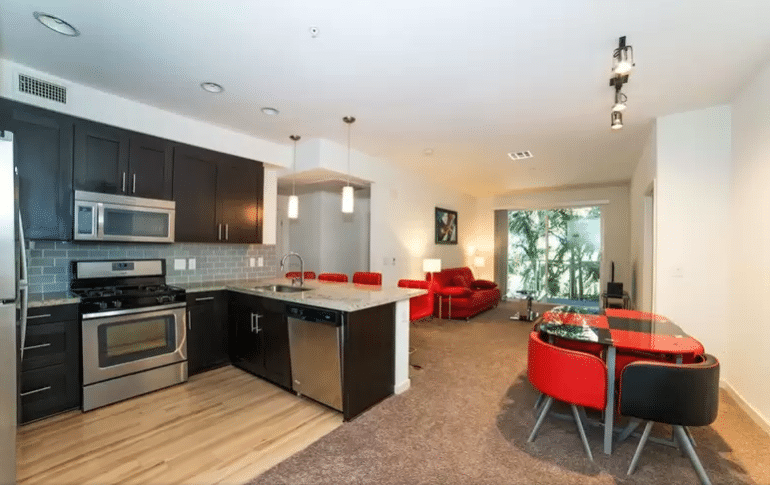 The Angels Suites in downtown Los Angeles boasts a retro chic design with some interesting color contrast decisions. 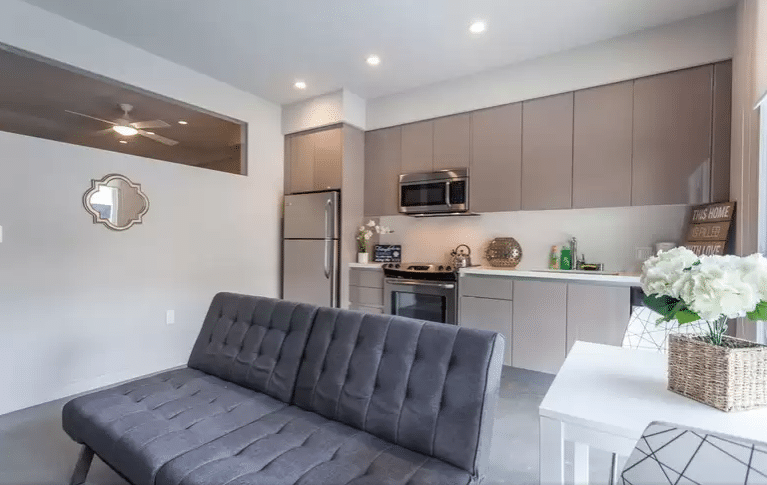 Renting full apartments for a little over $100 a night, the space does permit much larger kitchen aras than you might find in a similarly priced room at a more traditional hotel. The dark brown shaker cabinets with slight recess provide the potential cook even more space to move around, and we generally love the design of the kitchen space. The grey countertops help to transition the dark brown with the lighter shade of the flooring in a pleasant way. Tripbz specializes in providing furnished vacation and business rentals, so there’s a greater sense of “home” in their suites. 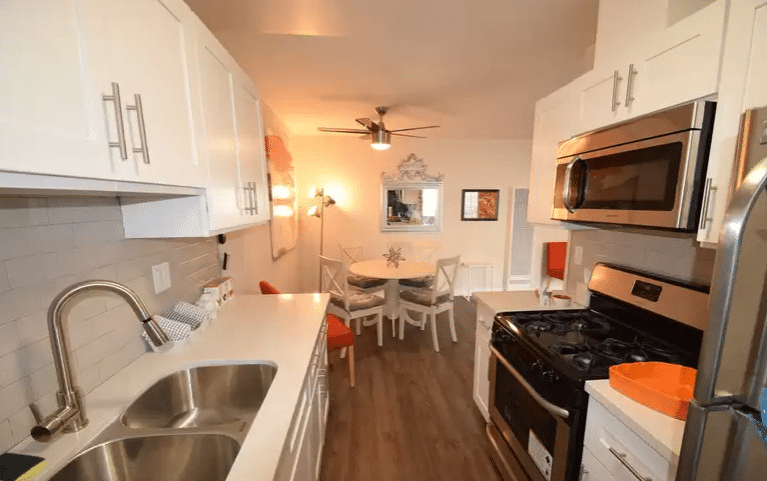 You can see it in the small touches like their kitchen art and amenities. Interestingly, this contrasts a bit with the extremely spartan layout of their kitchens. The slab faces of their cabinets bear no handles, needing to be opened by finding door edges with your fingers. This does add some aesthetic pop to the kitchen appliances as they extend farther into the room by comparison. Located just a 30 minutes jaunt from the Hollywood Walk of Fame, Boutique Hollywood boasts one of the coolest in-room kitchens we saw in our research. White shaker cabinets are a timeless classic and blend so well with virtually any other design decisions. You can see that the designer made liberal use of a greyish silver throughout the rooms, complementing the cabinet handles used. This really is a visual winner.